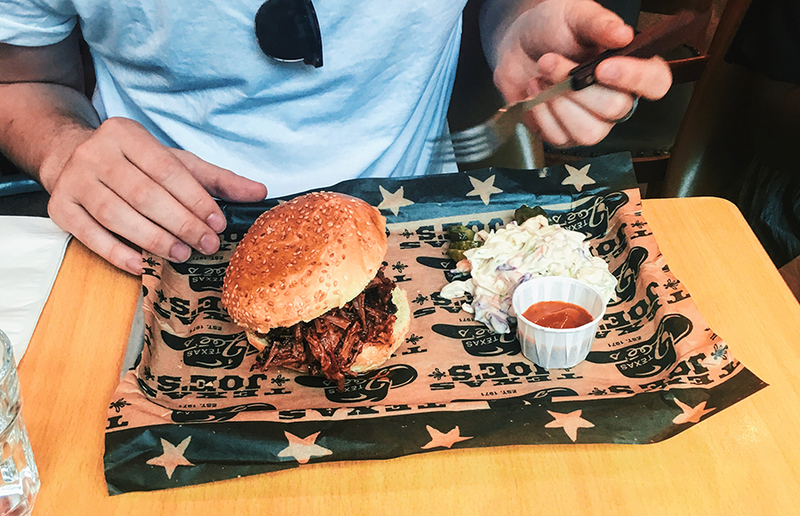 Texas Joe’s has just opened in London Bridge, here to take on some of the busy BBQ and slow cooked meat market. With it’s first store now open, we went down to take a look, try out the food and sample the experience! To give you some background, self-styled cowboy “Texas Joe” Walters runs the joint, and is… a real cowboy. From the boots to the hat, and of course the authentic accent. 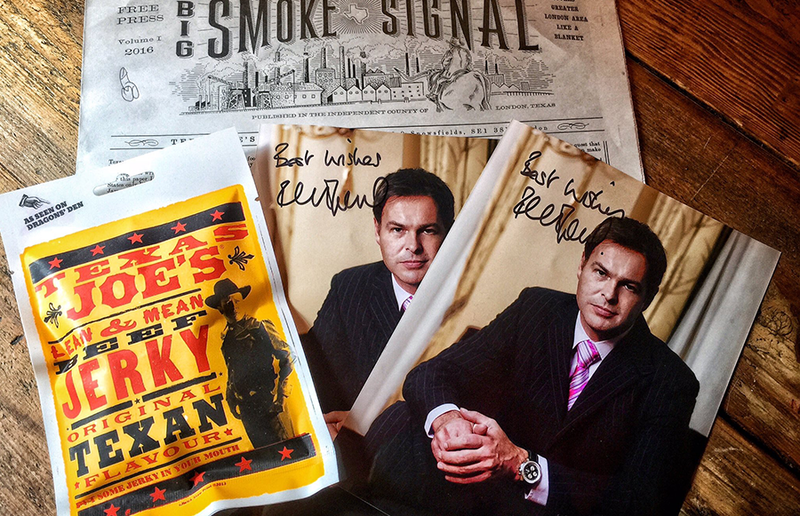 From Dallas, he made a name for himself when he appeared on Dragon’s Den three years ago and won £50,000 investment for his beef jerky brand from Dragon Peter Jones. However, it all went a bit pear shaped when the entrepreneur found out that Peter Jones pulled out of the deal off camera. 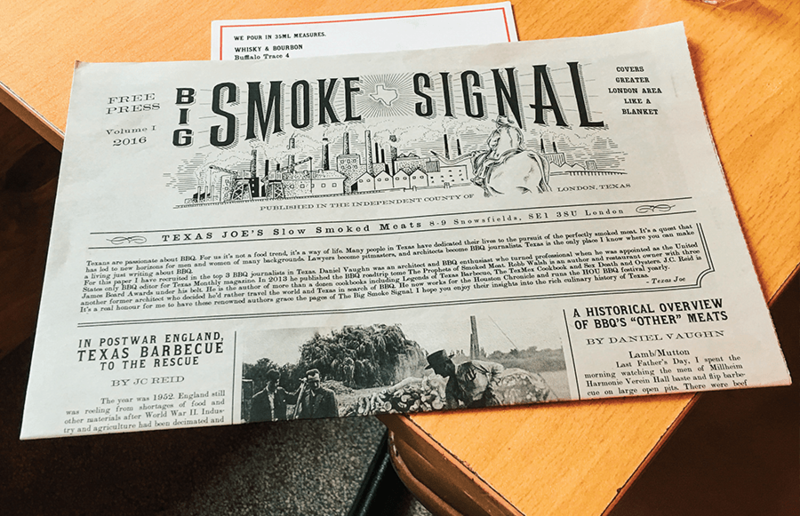 Jump on a few years later and Texas Joe’s Slow Smoked Meats is open. Just off Bermondsey Street the small restaurant and bar offers an ample sized menu for a hungry meat lover. What really does let the joint stand out is the style of the interior. Whilst many ‘American’ styled joints have big neon signs and lots of decor, Joe’s place is more basic, with, as he described himself a “spit and sawdust” look. You feel like you’re right in the kitchen, with exposed tiles, and lots of family styled frames on the walls. The menus are printed in the style of a 1930s Texas newspaper and a lot of the furniture is home made. It feels like an authentic ranch experience. On the menu is a selection of beef brisket and prime ribs, pork shoulder and traditional mutton dishes, which is made using meat from local Bermondsey butcher Nathan Mills, we’re told. The smoker is fuelled by aged oak wood from London Log Co and it can smoke 500 pounds of meat in a single bound. Wow. Alongside your meat you can get homemade pickles and bread, and a selection of US and UK craft beers and spirits in the bar which is next door. Oh, it also has a jukebox which you can actually play tracks off. We gave the beef brisket sandwich a go, which came with slaw, pickles and a sweet BBQ sauce. For £10.00 a serving, it’s on the slightly higher end price for the area, especially with Bunsmiths just up the road, serving a pulled pork sandwich, and fries for £7.00 as a lunch option. However, with a real authentic taste and locally sourced meats you do really feel you’re enjoying an experience which has been put together with love. There’s a clear passion in the air for what Joe does, and speaking to him you can tell he’s proud to have opened up in London Bridge. Whilst the restaurant is small, it has been busy since launch and with outdoor seats it’s fast becoming a local hot spot. We can’t wait to return to try more of the menu and enjoy Joe’s company. If you fancy popping down visit 8-9 Snowsfields London, SE1 3SU, and take a look at the full menu here.